Quality storage totes from Sterilite. Clear base with putty colored lid and platinum colored latches. 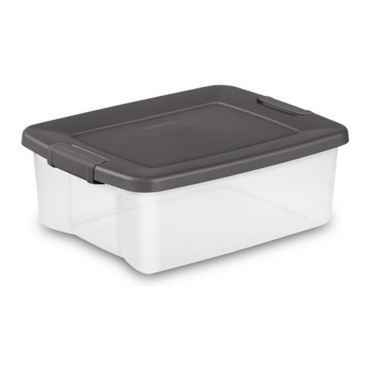 Sturdy stackable containers are great for home and office storage. Our 25 quart shelf totes double stack perfectly on the 5 shelf unit from Sterilite. A neat, versitile and long lasting storage solution perfect for your garge. Dimensions: 19 7/8"L x 7 3/4"H x 15 1/2"W Keep contents under cover.